Summary: Youngwoon is trying to sleep but it's difficult when his phone keeps buzzing with new messages. Disclaimer: I don't own SJ. Never will. Summary: Ten thousand feet in the air, Kangin learns to fall. Ten thousand feet in the air, Kangin makes a list of his three most hated things. Summary: They are exceptional people; talented and cool, yet warm and friendly. From the very first moment, they feel like a family to him. Summary: Kangin got a new puppy. Summary: Family isn't always limited to blood relatives. All Kangin wants is to be real. A/N: Short fic, 683 words. Contains Chemical inaccuracies. In which Youngwoon is one of the many electrons in love with Jungsu the proton, but ionic bonding cannot be avoided, and the Super Junior atom is a cation. Once he saw him he felt the urge to embrace him. He was scared but just a little. That Jungsu would not want it. That he would not want it. But the moment he saw that wide, honest smile and bright, shining eyes piercing him he knew it'll be fine. Summary: Jungsu is suicidal. But, for some reason, Youngwoon still loves him. A/N this was written for one of my closest tumblr friend's birthday. she's heechul's girlfriend lololol. p.s. this was written with a song in mind, "me" by the 1975. Disclaimer: I own absolutely nothing. 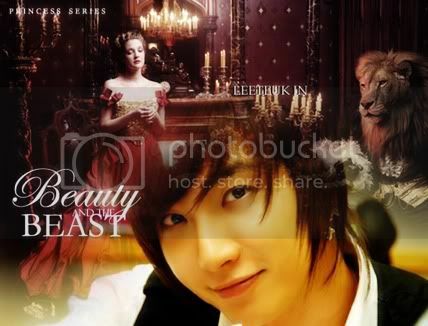 Super Junior belong to themselves and Beauty and the Beast belongs to Gabrielle-Suzanne Barbot and Walt Disney. Which, speaking of which, there may be some lines from the film..
Summary: To save his father, farmboy Jungsu sacrifices himself to be the prisoner of the great beast, Youngwoon. Summary: Serves as a companion fic for 'A Thousand Beautiful Things'. When Kibum was nine, he knew his mother was a street whore. Disclaimer: This is purely a work of fiction. I own nothing but the story and the plot. Note: Inspired by adorable Kim Kibum wearing Whystyle's necklace. “And you said you got the supernatural power of the necklace too, what was that again?” Kyuhyun asked evilly. Summary: The Han and the Kim Kingdom were never in good terms. Four years after Han Geng becomes king, he and his brother considers a plan on getting back at the Kims by breaking their only prince.